We all know the importance of cleansing our skin everyday from all the pollution, toxins and make-up it is faced with, but we must also focus on keeping the things we put on our faces clean as well. Our make-up brushes are exposed to the air and make-up which makes them prone to bacteria growing on them. Okay, it isn’t that bad, but after a few weeks the build up of even dust can create a sensitive reaction on your face when applying. Therefore, it is important to cleanse our brushes and other make-up applicators every two weeks. 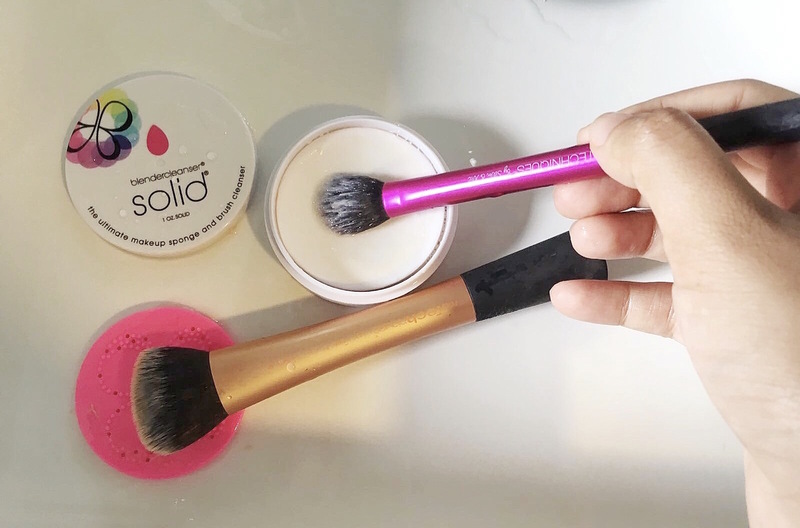 What I love about it is that it cleanses both your beautyblender® and brushes and it does so without getting the other parts of your brushes wet, except for the bristles. • I take a bowl of hot water and place it next to my sink. • I dip the make-up brush ( just the bristles) into the hot water. • I then rub the brush on the soap and you can actually see the makeup coming off. • I repeat the above steps till I can see all the make- up is removed. • I squeeze the bristles to remove the excess and run it through the tap water. • Lay it out to dry. This is a great way to clean my face and makeup brushes. Thanks to share this tips. I believe makeup is an important part of women's life and a perfect makeup brush gives a great finishing. That's why I love to use perfect makeup brush for my makeups & my Liquid Matte Lipstick for my lip.